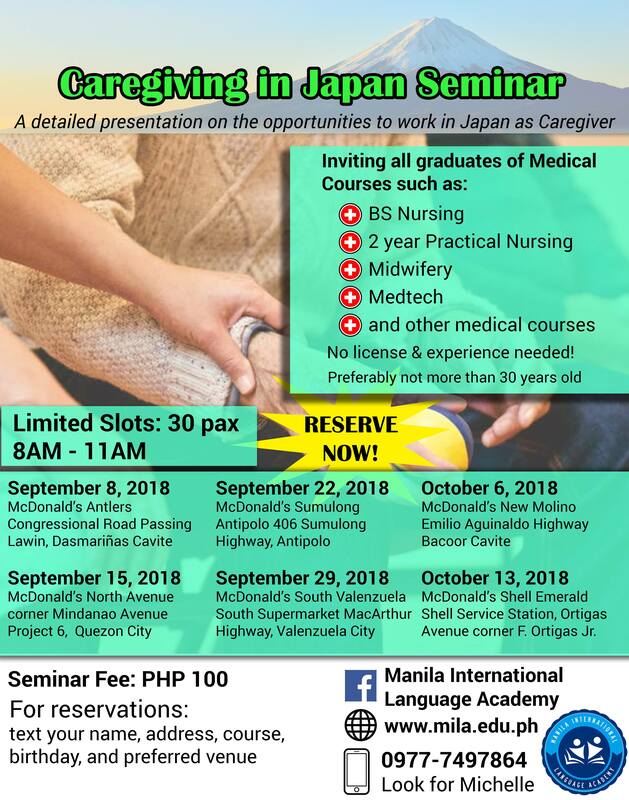 Join our 3nd Caravan this Saturday(September 22, 2018) in Antipolo as we conduct a seminar on how you can go to Japan as a Caregiver the easy way, don't miss the chance! Limited to 30 pax. RESERVE NOW! We are inviting BS Nursing graduates to join our FREE orientation and assessment on the following dates and venue: Requirements: * Graduate of BS Nursing * Not more than 35 years old * No experience needed * RN not a requirement Send your Resume with picture to leadgroupinquiry@gmail.com. Requirements: * Graduate of BS Nursing * Not more than 35 years old * No experience needed * RN not a requirement Send your Resume with picture to leadgroupinquiry@gmail.com.